Saturday, August 16 As I look back over the start of this trip, it is little wonder why I was so exhausted. The week before I left, things were about as hectic as could be imagined. The Saturday morning before we were to leave on Friday, I flew to Miami as in order to prepare to act as an expert witness (one of the defense first five) in a multi-billion dollar class action lawsuit. I flew back Monday night, not knowing if I would fly back down on Friday to begin the defense's part of the case or go on the vacation we had planned. Tuesday afternoon, I flew to Raleigh, for an EPA program review meeting. Flying home on Thursday afternoon, now 24 hours before we were to leave for the Winds, I still did not know if I needed to cut the grass one last time before vacation, or cancel our trip, and head back to Miami. (Susie and I had an alternate trip planned in case we had to cancel our Friday plans.) By the time I got home, there was a message on our answering machine to the effect that the judge had postponed the startup of the defense's witnesses, and basically, I was free to head for Wyoming. But the "fun" was just beginning. Ray, Barbara, and BJ had left on a mid-Friday afternoon flight, while I (and Susie), having missed so much work due to consulting and travel, had waited until after 5 pm to leave Knoxville. We were held on the runway in Knoxville for 90 minutes, waiting for a thunderstorm to pass over the Atlanta airport, and as a result, landed just as the last flight for Salt Lake City, our jumping off point, was pushing back. I knew this would be a memorable evening. After Delta was unable to come up with an actual gate to which we should go to find the airline on which they had booked us (so we would arrive in Salt Lake at 2 am Mountain Time! ), I suggested that maybe the next flight in the morning would be a better option. (There is a lot more to the comedy of errors but for the sake of space we will skip all that.) Communicating with our friends through the airlines and rental car agency in Salt Lake was a joke, and as a last resort, with left a message with Ray's wife as to our situation. 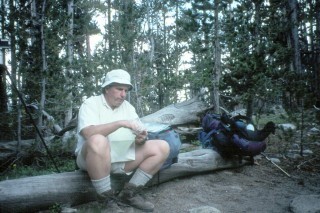 Sure enough, just after we had fallen asleep, Ray called and reported to Susie that they just had to go on to Evanston, WY, where our motel rooms were for the night. It took a long time to get back to sleep, so when the alarm went off at 4:10 am, and it was time to clean up and put on our clothes from the previous workday, not much sleep had been achieved that night. We caught the 6 am flight to Salt Lake, which was quiet and uneventful. We picked up a rental car that we had arranged the previous evening, and were rolling out of the airport by 8:30 am Mountain Time. To say we flew low is a bit of an understatement. We jogged into the Walmart to buy some Coleman fuel in Rock Springs, and the Wyoming State Trooper who clocked me going 77 in a 65 mph zone on US 191 was very nice, and just let me off with a warning. The road into the Dickinson Park Trailhead is really rough for the first 6.5 miles, but nevertheless, we made it from the airport to the trailhead in 6 hrs 15 minutes. Whew!! Of course, we had not done any of the common pack rearranging, and had to fill our fuel bottles and change out of yesterday's work clothes, but hey, what are trailheads for? We saw our crew's minivan, but I could not tell from the warmth of the engine hood how long ago they had arrived. We finally pulled out of the trailhead at 3:40 pm, figuring we were at least 2 hours behind the rest of our party, and I could tell within the first 300 yards that this was going to be a rough afternoon. The Smith Lake Trail is as flat as a pancake as it crosses via a boardwalk a huge, flat grassy area, that looks like it could be a very wet meadow earlier in the season. I felt like I was gasping for breath. 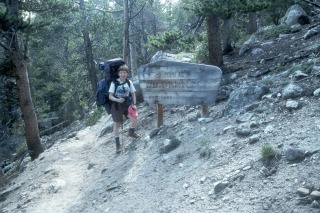 We had already been up since near 2 am Mountain Time, had very little sleep and no acclimation at a higher elevation. (OK, I can not remember what floor of the Holiday Inn we had slept on, but I don't think such would have made much of a difference.) After the meadow, we hiked through a lot of what must have been lodgepole pines, and came to the Wilderness Boundary Sign. I stopped and took Susie's picture (anything for a rest) and we trundled on down a gentle slop, losing some precious elevation. I was feeling so beat that even the loss of a foot or two was tough on my psyche. 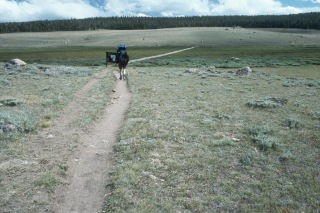 There are some nice views as you descend, but I really could not enjoy them. We started uphill again, and I just had to stop. Susie seemed positively bouncy compared to me, and I appreciated her tolerance of my maddeningly slow pace. I had a few snacks, but I knew if I did not get up soon, I would never get up. The long gradual grade up into the Smith Lake chain is not bad, unless you can not tolerate the least little bit of uphill. It was just about 6 pm, and we came to the junction with the High Meadow Trail, heading south toward the valley of the North Fork of the Popo Agie River. I pulled out the itinerary and map, and was disheartened to be reminded that the rest of our crew was not heading for Smith Lake, as I had "remembered," but Middle lake, which was over 1.5 miles up the trail. I think that Susie could hear the sound of the straw breaking the camel's back, and she agreed that we could catch our friends, who were planning a layover day on Sunday, in the morning. Just off the High Meadow trail at the edge of a huge meadow, with a rock wall reminiscent of Yosemite Valley, there was a lovely little campsite. 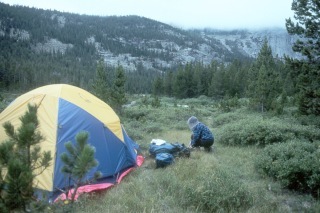 It had water, a great view, grass all around, and with the weather clouding up, it felt like home for the night. We put up our new Sierra Designs Stretch Dome, with luxurious room. We made up our version of Santa Fe chicken with rice after I had a little bath by the creek, and with the promise of a good night's sleep, life was looking better and better.